Captain Edward White had this three-storeyed, Second Empire duplex with a mansard roof built for his two sons and their large families. White and his sons were sealing captains, although the elder White was also a shipbuilder who pioneered the use of large wooden steamers in the seal fishery. Built between 1876-1878, the sturcture is a fine example of Second Empire design. White served as a member of the Legislative Council from 1861-1885 and minister without portfolio from 1882-1885. During his tenure in politics, White introduced the first sealing legislation that included in its provisions a fixed date for the opening of the seal-fishing season. To build the New House, White assembled an array of well-known local carpenters and craftsmen. Work began on the structure in 1876. William Campbell was the main builder, and possibly the architect. He had previously built the George Street Wesleyan Church. Thomas Burridge and John Hallet, who also worked on the Wesleyan Church, performed the masonry work. Many of the building details of the house are known from a detailed daily journal kept by Captain White. Beneath the clapboard, the builders spread 200 weight of birch bark to provide insulation. The servants' bells, also termed "Angels Bells," were installed in the kitchens and linked to all rooms. There was also a "steaming rail" installed. This referred to the process of curving a hardwood railing by placing it into a steambox. The total cost of the completed house in 1878 was £1531/0/6, approximately $7,600. Except for the years from 1945 to 1968, when an outside family owned 335 Southside Road, the dwelling has remained with Captain White's descendants. Currently, the Story family owns the house. The Story family is also linked to the Whites. Edward White's granddaughter, Dorothy married George E. Story. Number 337 Southside Rd. is owned by Janet Story, 335 is owned by Lachlan Story. One of its best-known residents was Newfoundland scholar and educator George M. Story. Among the most popular of his works include the collaborative effort, The Dictionary of Newfoundland English. Former President of Memorial University of Newfoundland, Dr. Leslie Harris considered Story "a true renaissance man," and "the greatest Newfoundland scholar of his age and one whose like we will not soon see again." 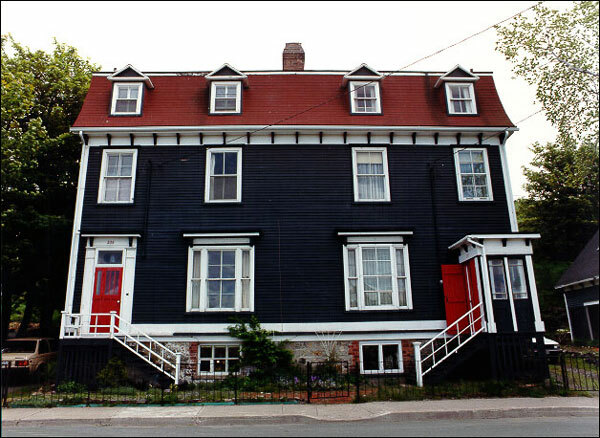 The New House became a Registered Heritage Structure in June 1994.
on the Heritage Foundation of Newfoundland and Labrador web site. The Newfoundland and Labrador Heritage Web Site has on its site only a portion of the registered heritage structures in Newfoundland and Labrador. To view a complete list or search for a particular structure visit the Heritage Foundation's Property Search page.